Who collects costs for Trump’s Taiwan call? 1 Who collects costs for Trump’s Taiwan call? 2 BEIJING (Reuters) – There are many pressure points China can push to express its anger at Donald Trump’s call with Taiwan President Tsai Ing-wen last week, including luring away more of Taiwan’s diplomatic allies and ramping up military deployments in the Taiwan Strait. "Without a doubt, if the Chinese government judges a president Trump wants to challenge the 'One China' principle followed since President Carter, China will definitely make a very strong response." 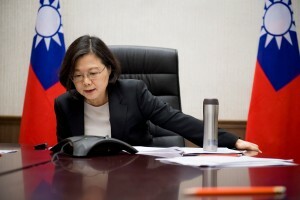 BEIJING (Reuters) – There are many pressure points China can push to express its anger at Donald Trump’s call with Taiwan President Tsai Ing-wen last week, including luring away more of Taiwan’s diplomatic allies and ramping up military deployments in the Taiwan Strait. China’s irritation with the call, the first by a U.S. president-elect or president since President Jimmy Carter switched diplomatic recognition from Taiwan to China in 1979, has mostly been directed at the self-ruled island China claims as its own. But it could also make life difficult for the United States and its allies in the region. Shi Yinhong, head of the Centre for American Studies at Beijing’s Renmin University, who has advised the government on diplomatic issues, said China was still in a wait-and-see period when it came to Trump, noting Beijing’s reaction to the call had been quite restrained. But that would change if Trump continued like this in office, Shi said. That could include policy towards North Korea, where China has been working with Washington to rein in Pyongyang’s nuclear programme, or in the disputed South China Sea. “Everything is possible,” he said. Beijing could, for example, ease up on United Nations sanctions on North Korea, providing economic succour to a country developing missiles that could target the United States, or take a more aggressive stance to U.S. freedom of navigation patrols in the South China Sea, where it has so far limited itself to verbal warnings. Washington and Beijing have also cooperated on the multilateral agreement to limit Iran’s nuclear programme and on climate change, areas that Trump has said he wants to revisit to get a better deal for the U.S. The status of Taiwan is an unresolved issue from China’s civil war, when defeated Nationalist forces fled there in 1949, posing a pointed challenge to the Communist Party’s claim to rule all of China. Beijing has never renounced the use of force to bring what it calls a “renegade province” under its control, and Taiwan estimates that China has hundreds of missiles targeting the island over the narrow straits that separate them. The Global Times, an outspoken and influential tabloid published by the ruling Communist Party’s official People’s Daily, said punishing Taiwan was the best way to convey a message to Trump. “The Chinese mainland can let Taiwan lose one or two diplomatic allies as a punishment as well as a warning. The mainland can also strengthen its military deployment,” it said in editorials in its Chinese and English editions. The number of countries maintaining formal ties with Taiwan, which until 1971 held China’s seat at the United Nations, has since been whittled away by China to just 22, mostly poor nations in Latin America and the Caribbean. An unofficial diplomatic truce between China and Taiwan ended earlier this year after Tsai was elected in January, when China established ties with former Taiwan ally Gambia. Last week a large Chinese business delegation visited Panama, another Taiwan friend. Tsai says she wants peace and stability with China, but China fears she wants to push the island’s formal independence, one of the core principles of her Democratic Progressive Party. China could also step up its divide-and-rule policy favouring pro-China politicians in Taiwan with trade and access deals, while excluding those from the ruling party. The People’s Daily overseas edition said the Trump-Tsai call set a “terrible precedent” for China-U.S. ties and put a big question mark over a smooth transition in the relationship. Jia Qingguo, dean of the School of International Relations at Peking University and a government advisor, said the incident would help Chinese leaders get past initial uncertainty about Trump and better understand what his administration could mean for China, but “in a negative way”. Beijing also has to bear in mind the opinion of a Chinese public brought up to insist on sovereignty over Taiwan. China and Taiwan have nearly gone to war three times since 1949, most recently ahead of the 1996 Taiwan presidential election. Then, China carried out missile tests in waters close to the island, hoping to dissuade people voting for Lee Teng-hui, whom it suspected of harbouring pro-independence views. Lee won by a landslide. In the intervening 20 years, Chinese wealth and power have grown.